Who doesn’t love Argentinian Malbec? It is softer and less tannic than its French sibling from Cahors. Lauded for its generous texture, inky violet colors and fruit forward flavors, most entry-level Argentinian Malbec is ready to drink now and won’t bust your wine budget. It’s no wonder it has become a go-to staple in households everywhere. 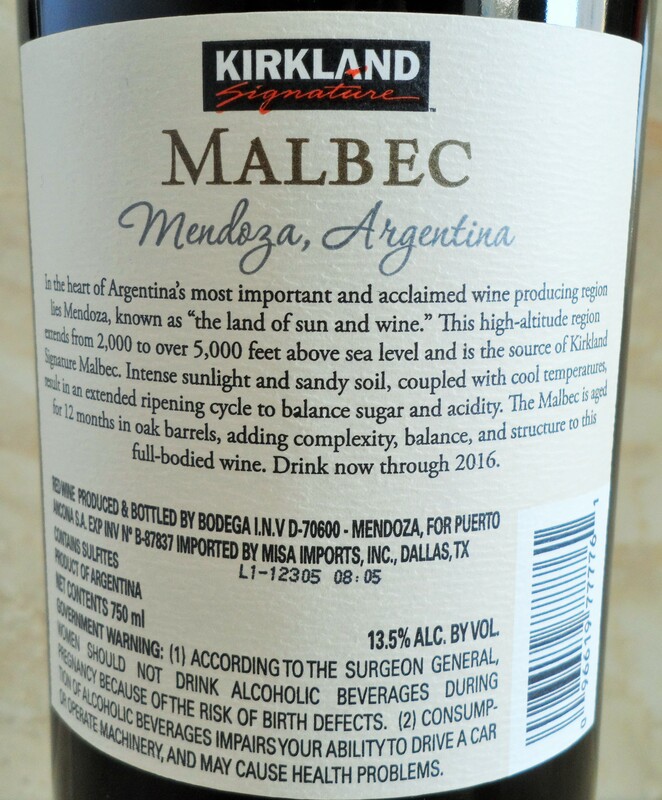 I am always excited to try a new Malbec as well as any of Costco’s Kirkland Signature wines so when I saw Costco’s Kirkland Signature Malbec 2011 Mendoza I simply had to try it. 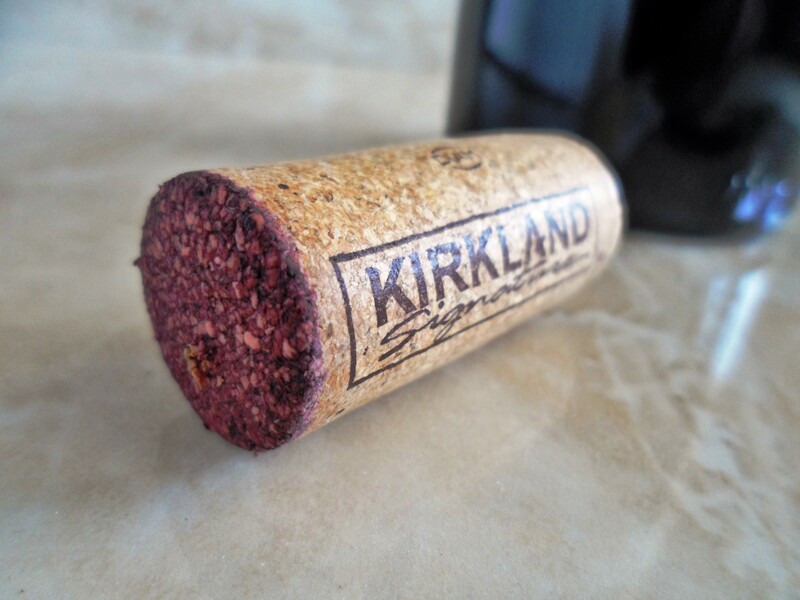 Don’t miss my Costco Wine Price Guide or my post on the Costco Wine Program! Appearance: Deep reddish purple but not quite as inky as other Malbecs can be. Nose: Sweet red fruit, licorice and some heat (alcohol) coming through. Taste: Medium bodied with flavors of cherries, raspberries, licorice, chocolate and toasty oak. The finish is somewhat unrefined and unbalanced with a short, hot and slightly gritty finish. Should you buy? Try the Costco Malbec in a different vintage. 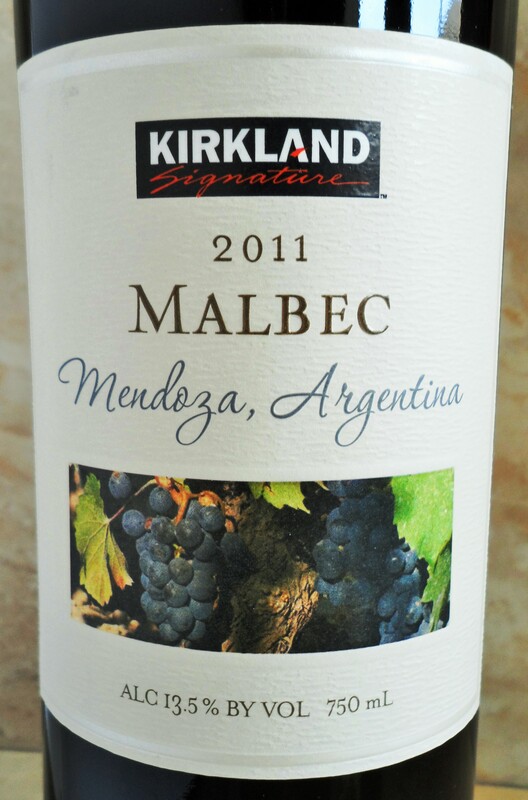 I am somewhat disappointed with this Malbec as I have enjoyed many great wines from the Kirkland Signature Wine Program. Quite frankly I thought this Malbec would be a shoe in. While I didn’t sense any evidence of it being corked or cooked, it is possible that I purchased a bad bottle. Perhaps this attempt by Costco to produce a bargain Malbec was a miss. 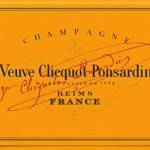 Ironically, many of their iterations of more expense wines, such as Champagne, Rose Champagne, Napa Valley Cabernet and Napa Valley Meritage, for example, have been really enjoyable considering their price. Costco’s price for this Malbec is $6.99. While that isn’t all that much one must consider that for $7.39 you can get the Alamos Malbec, which is also from Mendoza but has a consistently good track record. Considering the similar pricing and location of the Kirkland Signature Malbec (right next to the Alamos) it seems obvious that Costco intends for their wine to compete directly with the Alamos. While I think it is great to have options, I believe the Alamos is an enjoyable, value-oriented Argentinian Malbec and it is well worth its small price premium. It is a more balanced, smoother, more refined wine. With the Alamos I think you can compete with wines in the $10-12 range, while I feel our subject wine today struggles to make an argument for its $6.99 price. While I considered not sharing that I wasn’t particularly fond of the 2011 Costco Malbec today, I felt I needed to because I have been such a strong proponent of Costco’s Kirkland Signature Wine Program. Hopefully this wine is a rare miss in an ever increasing catalog of great wines at prices consumers can more easily afford. 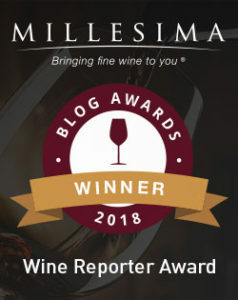 This entry was posted in Between $5 and $9.99 | Reviewed, Costco Wines - Reviewed, Red Wines, Under $10, Under $100, Under $15, Under $20, Under $30, Under $50, Under $75 and tagged Alamos Malbec, Cahors, Costco, Costco Malbec, Costco Wine, French Malbec, Kirkland Signature, Mendoza Argentina, Mendoza Wines, The Fermented Fruit, Wine Bargain, Wine deals, Wines of Argentina on March 17, 2013 by The Fermented Fruit.